The Karma Chameleon singer will put out his upcoming album on his own record label, according to Digital Spy. This Is What I Do is due to be released on October 28 through his label Very Me. 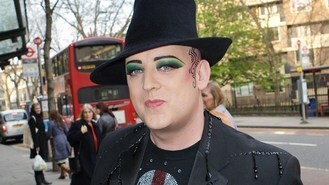 Boy George has worked with his long-time writing partner Richie Stevens on the record. He said: "I wanted to make a baggy album, not overproduced and I think I have achieved it. I was listening to things like Beast Of Burden by The Stones, and I had my head most definitely in the 70s. "Richie's approach was very organic and he's the best drummer in the country so the feel of the record was so locked in from the start." Boy George added that the album was a happier one than some of his previous releases. He said: "I was also writing from a happy place. This time, no ex-lovers to get revenge on. For me Bigger Than War sums up the tone." Musicians he has collaborated with on This Is What I Do include DJ Yoda, Kitty Durham, Ally McErlaine, MC Spee and Nizar Al Issa. The 12-track album will also get a seven-date tour of the UK in November, taking in Manchester, Birmingham, Leeds, Glasgow, Oxford, London and Brighton.